Jeremiah Bishop isn’t much of a day drinker. We’re sitting in an upscale pizza joint with half a dozen taps dedicated to beers made right here in Harrisonburg, Virginia, and I'm having a hell of a time convincing Bishop to order a pint. Sure, it's only 2 p.m., but we're fresh off a fun, sun-drenched ride at Bishop's home training ground, Massanutten Mountain, and it feels like the kind of afternoon when you start drinking early. But then, you don't become Jeremiah Bishop by making a habit out of day drinking. Bishop has been a cross-country force for more than a decade, riding for the USA Cycling National Team 14 times. He won gold at the 2003 Pan Am Games, finished eighth at the World Championships in 2006, and has been the National Champion twice (once in short track, once in marathon). Over the last few years, he's focused on the endurance side of the sport. 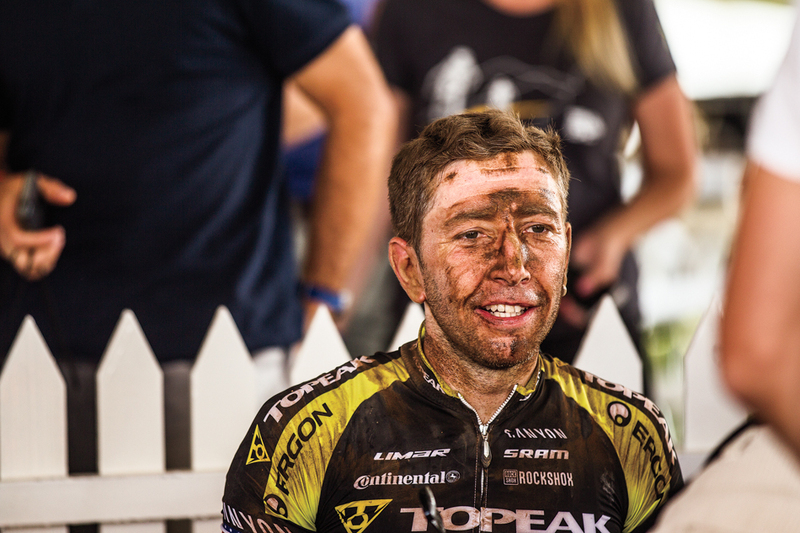 In 2014 he was the reigning National Ultra Endurance Series Champion, and has more stage-race victories than anyone else in mountain biking. Bishop, a thin, soft-spoken guy with a thick silver earring in his left ear and specks of gray starting to show in his short, cropped hair, has dominated his corner of the sport for 13 years and counting, staying ahead of the pack for twice as long as most of his competitors. Now, pushing 40 and with all of the things that come along with being 40 (two young kids, a wife, mortgage, back problems…), Bishop is keenly aware that his winning streak can't last forever. "It doesn't matter how hard I train, I'm not getting any faster," Bishop tells me earlier in the morning as we pedal toward Massanutten Mountain, a long, green ridgeline outside of Harrisonburg where the local club has developed 800 acres of steep terrain. "You take a prize fighter, the top dog, someone who's judged by their victories, and tell them no matter what they do, they're not as sharp as they used to be–that's a tough reality to handle." Retirement is an awkward transition for anyone, but it's downright bizarre for a pro athlete who would be in his prime in any other profession. Bishop probably has four decades of providing for his family in front of him. What does a 'prize fighter' do in the second half of his life? It's a unique mid-life crisis–one that only Bishop and a handful of athletes who have reached his level of success can understand. And it's probably why Bishop jumped at the opportunity to race for a million dollars in cash. If you haven't heard of The Munga, here's the spiel: The Munga was to be a single-stage race across South Africa, sending mountain bikers on a 1,000-kilometer, unsupported push across the southern tip of Africa. It would arguably be the toughest mountain bike race on the planet. With an advertised total purse of $1 million, it would definitely be the richest. Bishop would have to win all 800 USAC-sanctioned races to match the score of The Munga, so he dedicated an entire year to obsessively train for it. 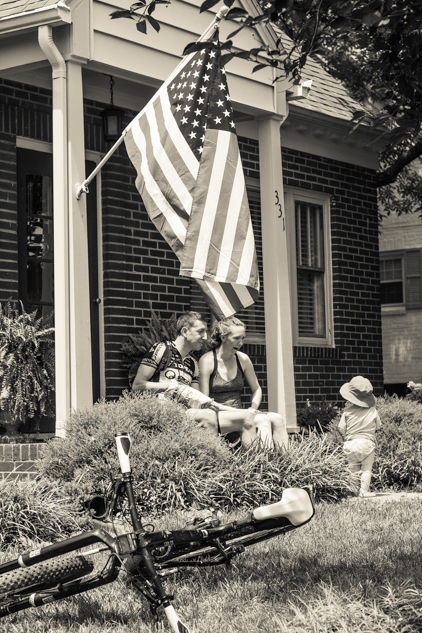 Instead of just racing ultra-endurance events like the Shenandoah 100, he rode his bike to and from the race as well, tacking on another century. He sandbagged his Strava workouts, only logging half the miles that he rode on the site so competitors couldn't spy on his progress. He rode the Stokesville-Douthat-Stokesville, a 150-mile group ride on backcountry singletrack through George Washington National Forest that usually takes three solid days, in a single 20-hour push, starting in the afternoon so he could get a taste for riding through the night. "I was in a different kind of shape after training for The Munga. I could break rocks with my bare hands. I was ready," Bishop says. "Doing something like riding 20 hours straight through the night makes you see life through a different lens. The Munga energized me." The timing of the race couldn't have been more perfect. After a long, successful career of racing for peanuts, along comes The Munga, with a retirement package for a grand prize. Suddenly, Bishop had his exit strategy: Win a million dollars. And then The Munga fell apart. A key sponsor pulled out of the race, and everything Bishop was working toward, his golden parachute, disappeared. "I thought the race was going to happen, and I thought I had as good a chance as anyone to win it, so I shifted gears. Honestly, I lost a lot of opportunities because of it," Bishop says, adding that Cannondale dropped him because he stopped focusing on winning XC races for a year. "I did a lot of badass stuff last year, but it wasn't racing XC. It was specific training for The Munga. That big prize money was my focus. It had to be my focus." But then, Bishop was always in it for the money. He grew up in a rough neighborhood in Baltimore, with no father and a mother who struggled with drug and alcohol problems. He entered his first mountain bike race in 1992 on a stolen bike. He got busted, and eventually returned that bike, but not before winning the state championships for his age group. "I've always raced for the money," says Bishop, who borrowed $500 from his teammate, Chris Eatough, to cover the costs of his first TransAlp Challenge, an eight-day European stage race. He and Eatough slept in gymnasiums during the race, and ended up winning the final stage. "I never had two pennies to rub together, so I was racing for groceries. Mountain biking saved me." We're riding Massanutten with one of Bishop's training clients, Cole, a young pro mountain biker from Philadelphia who's covered in tattoos. Massanutten has maybe 20 miles of singletrack, with a shocking variety of terrain. In two hours, we bust up steep, punchy climbs, pedal through mountainside meadows, find fast, flowy downhills and work our way through long stretches of chunky, baby-head boulders. Bishop believes in scenario-specific training, so he has a short-track loop carved out on the mountain, as well as a World Cup loop that's steep and technical. Once a month, he'll train with a motorpace at the base of Massanutten, where he tries to re-create race speed by following a dirt bike around mellow trails at 25 miles per hour until someone throws up. "I'm always asking myself, 'Am I working harder than a 24-year-old?' These are fighters who want my job. Am I out-hustling them?" On our ride, Bishop and Cole play follow the leader. If Bishop does a kick-out, Cole has to do one. If Bishop bunny hops a rock, Cole has to bunny hop a rock. 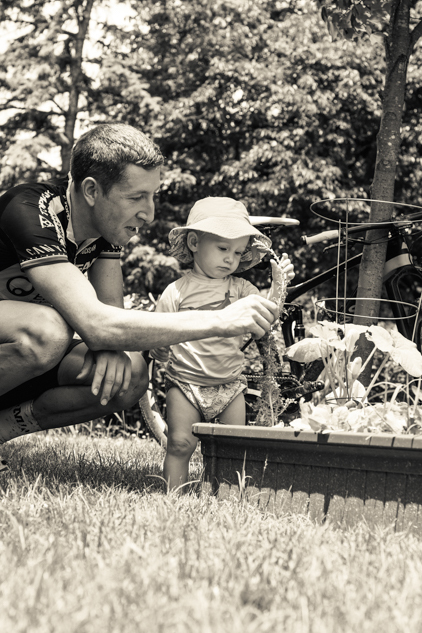 This is Bishop's plan B–transition from a full-time racer to a full-time coach, where he'll take a hands-on approach to coaching, pedaling through each workout with the young talent. He's keeping his client list small while he continues to race full-time, but he's already seen success from clients like Joe Dombroski, a young pro road cyclist who made a great showing at the most recent Tour of California, coming in fourth overall. Bishop is a natural coach, and he can't help but notice that I'm not a natural mountain biker, so he gives me pointers throughout the ride. At the top of a long climb, we ride off a steep slope, through loose shale and into a pine-barren forest. There's a huge view of Shenandoah Valley, its dairy farms rimmed by mountains that make up the West Virginia border. Bishop knows all of them by name, and has a riding story for each. Like his winter workout on Narrowback Mountain, when it was 22 degrees and snowing with howling winds. He was in spandex and covered in sweat when he flatted. The pump froze so he couldn't inflate the tube. He was getting hypothermic, and frostbite was nipping at his fingertips, so he ran as hard as he could with his bike on his shoulder for 6 miles until he found a ride. "It could've been bad. There are consequences to this kind of job," Bishop says, recounting his concussions and collection of broken bones. "I've had 12 or 13 breaks. I have titanium hardware in my face. I broke my back once, which I still feel in the morning. When you have kids to take care of, it's hard to justify the risks I take. If I get beaten up, how do I take care of my family?" 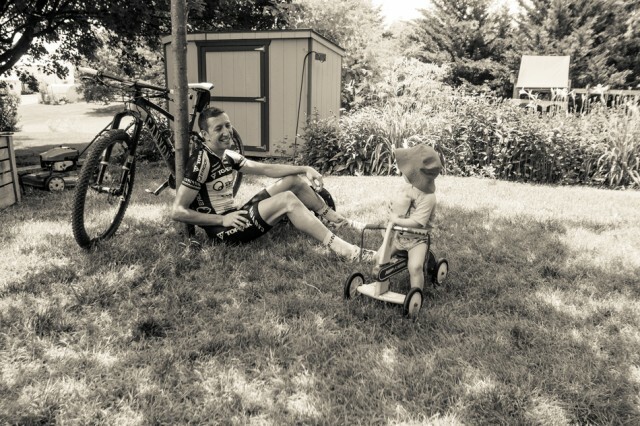 Bishop's kids are 6 and 1, and he's as much a stay-at-home dad as he is a professional mountain biker, splitting the day between training and pushing his youngest on the swing, or taking his oldest to ride at the skatepark. "I spend a lot of my day holding a baby while wearing a dirty chamois," he says. 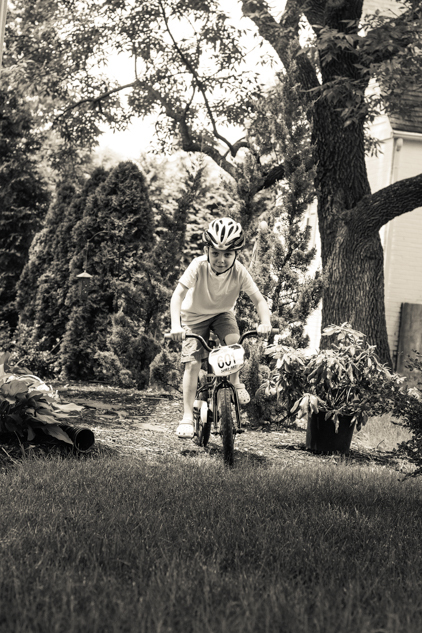 "Racing on the weekends is tough, because that's when my oldest is out of school and ready to hang out. Every big race I do, I tell myself it's the last time I'm gonna do it. And I mean it. I figure I have two more years racing at this level, and then…"
And then it's coaching full-time. And helping to develop the Virginia High School Mountain Bike Series, and spearheading a mountain bike summer camp for kids and continuing to lead his Alpine Loop Gran Fondo. "Racing is super fun, but it has a onedimensional return," Bishop says. "With coaching, being able to give that knowledge to someone else is rewarding on a whole different level. And being able to help kids is where it's at. Biking allowed me to get myself outside of my environment in Baltimore. It allowed me to change the script of my life. I'm hoping I can help other kids have the same opportunity."